Have you had enough rain recently? No? Well, you're in luck, because the D.C. area could get several more inches by Friday night. A flash flood watch expires at 10 p.m. Several flash flood and flood warnings were issued through the afternoon and evening. The city of Frederick closed all city sports fields because of the rain, and several roads in the Thurmont and Emmitsburg areas were closed Friday afternoon because of high water. Traffic has been slowed all day on the Beltway and Interstate 95 due to the weather, the Associated Press reported, and that was expected to continue through the evening rush hour. This particular storm system, while not as bad as what we had with Tropical Storm Lee and the remnants of Hurricane Irene, could provide enough rain to cause flooding. News4 meteorologist Tom Kierein said that since the ground was already saturated, all it will take is 1-2 inches for creeks and streams to go over their banks. Almost an inch had fallen at Reagan National Airport by 7 p.m., and some areas got as much as 3 inches. Fortunately, the showers are moving fast, and by about 5:30 p.m., rain had stopped falling in the suburbs west of D.C. The rain is coming from two weather systems -- one is an area of low pressure that is locked in place in the upper Midwest, and the other is an area of high pressure off the New England coast. Both of these systems are providing a persistent southerly flow that is bringing in tropical moisture, and will continue to do so through the rest of Friday and part of the weekend. The moderate to heavy rain should continue throughout the afternoon and evening. 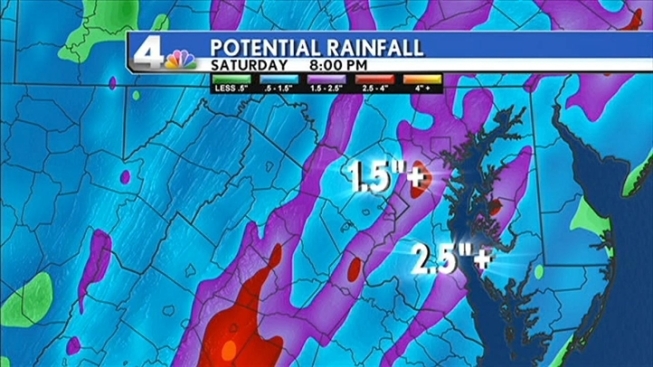 Around the metro D.C. area, we should receive between 2-3 inches of rain by midnight. Some isolated areas may see totals as much as 4-5 inches. Remember, stay away from high water. Flood-prone areas will likely have high water. Some of the areas that were flooded out a couple of weeks ago -- like the Woodbridge, Va., area -- could experience more flooding, but not as catastrophic as what happened in recent weeks. It does appear that the weather system will weaken in the Midwest and slowly drift away from our region by the middle of next week, Kierein said. Between now and then we still have the chance for more rain over the weekend and a much smaller chance on Monday and Tuesday of next week. So there is hope! Oh, and here's a fun fact to share with your co-workers on a rainy Friday: Since Aug. 1, Reagan National Airport has received more than 16 inches of rain (not counting any received on Friday). The average rainfall for August and September: 6.65 inches. And we've still got eight days left in the month. Glug. Check in with News4 and NBCWashington.com for updates throughout the weekend.